Update July 2016: This article is outdated and with appimage I'm not using PPA anymore, if you have new information about the PPA, leave them in the comment! thank you. The Krita team has an official ppa ( named Krita Lime ). 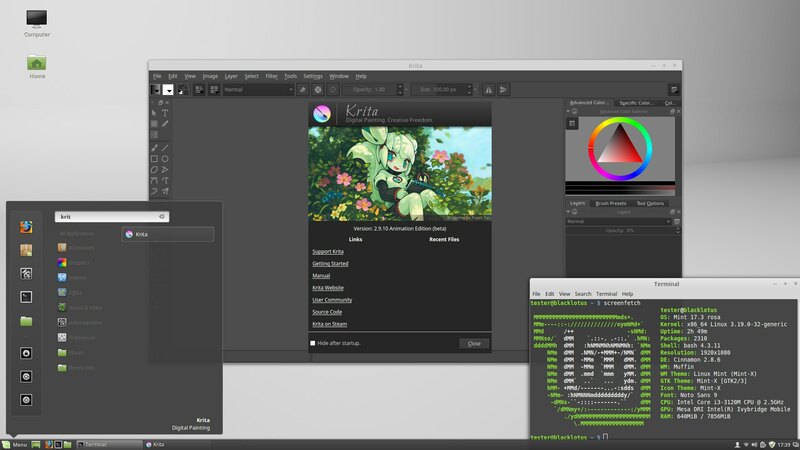 This ppa provides fresh versions of Krita for Linux Mint 17.3 , Ubuntu 14.04 LTS ( and Ubuntu-testing 15.10 ) and Elementary Freya 0.3 users. To install Krita via this ppa, copy the code lines one by one ( Ctrl + C in your browser ) and paste them one by one in a terminal windows ( Ctrl + Shift + V ) then press enter. Note: You can only install a single version of Krita on your system. This is the last release of Krita, in the 2.9.x series. This is a popular beta release ( in progress ) with the features 'animation' and 'level of details'. License: CC-BY David Revoy, www.davidrevoy.com, 16 january 2016 . Good to see you back! I am using it for some time under Linux Mint - so far works flawlessly. Awesome! I just installed it on Kubuntu 13.04, working great. I had to restart my system to get Krita to start though. Is that normal? @lachoneus : Thanks for the tip ; I really need to test Kubuntu 13.04 , btw. About the restart, I don't know. Probably a lot of updated dependencies needs to be re-run to launch Krita. I saw quite a lot of libs updated in my test. I've tested Krita Lime under Xubuntu 13.04, there was some bugs for me, but some new features are awesome. About reboot - yes, Dmitry Kazakov told me that is necessary after installation. but with 52 the A3~A6 runs without any problem. @ IK.Vincento, also you may try to Enable OpenGL, it may increase speed too. For example, if you rotate canvas with CPU rendering it becomes slow, but with OGL it OK.
@kot-barbos : hey Kot, thanks for confirming ; and also thanks for the news about the PPA, I knew about it thanks to your post on the comment of my previous article. @IK.Vincento : Yes, Kot is right ; try to turn openGL on on the preferences, it may help if your CGcard is better than your CPU for Krita. Turning down the ppi sure will make everything faster but you'll loose in quality and resolution. Big and complex brush are always slower than geometric and simple little brush. Thats why it's easier to start an artwork on low resolution and upscale it on the way for low computer performances. Also, the processor may help performances : Krita behave quite fast and smooth on a 2.8Ghz icore7 . je sais pas quomment vous faites mais je suis touché par chaqu'un de vos dessins . bravo !!!!!!! Wow. thank you guys. Enable the open-gl makes my krita run like a charm. @jules leroux : (◡‿◡✿) Merci ! Pour mes études, j'ai fait un Bac Art-Appliqué au Lycée Marc Chagall à Reims puis j'ai continuer ma formation après bac en autodidacte. I got a new Bug with the OpenGL enabled .. my krita 2.8 have a brush lag and the brushes don't work on canvas. If you try press the second button for show the Quick menu ...a bug comes again and all stop work. Anyway I try install a new clean version ...and anything change. Hey, as for now Krita works very good in Linux Mint 15 Cinnamon 64 bit but could someone tell how to create launcher? How to install additional brushes for example V2.1? I've placed those brushes in /.kde/share/apps/krita but they don't appear after Krita start. I was using Ubuntu for a long time but 12.10 and 13.04 are disaster for me - shame because I like Gnome Shell very much. As for Mint 15... it's very nice OS and what's more important it works out of box with some minor tweaking so I definitely recommend it. Only thing I couldn't find in Mint is Wacom Settings Applet - have no idea where it goes. I've checked brush directory and it's definitely same as yours but they won't show up in Krita. Maybe I will delete .kde directory and try to reinstall Krita... will see. @Michał : Weird, :-/ Maybe a permission issue on the uncompressed file ? I look for some "live" demonstration of how Krita is being used by skilled artist like you. @Drayldan : Hey DrayIdan ; I don't think the macro works for painting ; I think video recording and playback is still a better option. I'll try to make new video about Krita soon. I've seen somewhere demo about new brush in K 2.7... is this brush also in K 2.8? @Michał : Hi, ouch ! hard to switch distribution ; but I understand the quest of stability ! If you point me the demo ; I 'll can give you infos on the brush ; a lot of artist create brush preset. The default kit is maintained by Animtim. It was demo made by you David(I think)... something with oriental flower in title!? I don't remember where I have seen this. This is a stupid and newbish question, but how does one continually update this version of Krita? What do I type in the terminal? Also, is there something like this available for Gimp and MyPaint? Or are their ppas pretty much the same idea? Thanks for everything you do! I love the new features that will be implemented later for 2.8. *-* The canvas extending feature is a work of genius! @Michał : oh , this one :-) I have to share it. I must update my brush pack. I can't share only the *.kpp file of preset : this brush need a special shape and a special texture to work. I'll update my brush kit soon. It can be reproduced with a 'smudge brush' engine, a 'predefined brush' bitmap mask looking like dots with few spacing, a bit of paper texture in it. I have installed 2.8Alpha1 on Kubuntu 13.04. Directly after Install there's no Menuitem created and launching from Terminal wasn't possible. Rebooting fixed both as mentioned above. @GrindGod : Hey GrindGod, your test are precious as I don't know testers yet on 13.04 ; but developpers will not see it on my blog , or remember about it. Hi, is there a site where the changes in the test build are documented (in a user-friendly readable way)? I have done some research but found nothing. @GrindGod : Hi GrindGod, this one is probably the most user-friendly readable way : http://quickgit.kde.org/?p=calligra.git&a=shortlog. Salut David, j'aimerai suprimer ce ppa ainsi que le krita les dependances qui vont avec pour installé depuit le ppa:kubuntu-ppa/backports pour avoir la dernière vertion stable pour voir si sa régle mon problem de canvas refractaire. Mais j'ai peur de foutre le bordel comment doit-je faire pour ne pas réinstaler toute ma distrib? @hideaki : Coucou , sous les 'buntus ; l'outil s'appelle 'ppa-purge' , mais peux être dangereux comme pour toute manipulation des paquets. Je conseil fortement un backup avant de jouer avec ça. @azrul : Thanks for the feedback ! Good to know this PPA still is in sync with older 'buntu base as 12.04. Support till 2017 is still a good deal for this OS family. Here I can't test it anymore daily, because I distrohopped to Manjaro , and keep it now longer than just for a test period. I tested Elementary OS , and loved it. But, Pantheon , -as every compositer- is still a bit on my way for the frame rate of brush stroke and general smoothness. I still prefer Openbox/Awesome or Xfce without compo for my workstations. Elementary OS will probably be the OS I'll install for family and on my HTPC ; I just have to upgrade kernel and some dep to make it compatible with USB of Android devices. I'm new to Ubuntu, so thanks for the simple instruction to type Krita from the terminal. I couldn't launch it otherwise, and thank you Mr. Revoy and the Krita team for all of your dedicated and difficult work! @ElectricPrism Open a terminal and open krita. @MarlokPopapop Chukichuki : Hi, unfortunately you can't install Krita 2.9 on this old version of Ubuntu. Also, my article is from May 2013, and two years is a lot in Linux world a lot of things changed. [ update ] : Previous version was published in 2013/05 ; Today I updated the article and tested the ppa. Hi, you said "You can only install a single version of Krita on your system." Does this mean I need to uninstall the 2.8 version I have before type those lines in the terminal? @eukleyv : Yes, you need to remove the 2.8 before upgrading 2.9 via PPA. je voudrais tester le hdr painting avec krita ( pour ajuster le/les sources de lumière de panos 360 hdr) mais je me trouve confronté à un gros problème de lenteur dès l'ouverture d'un .exr ( ~10 min juste pour l'ouverture) aurais-tu une piste pour remédier à ce genre de problème ? Je suis sous ubuntu 15.10 64bits 24 Go ram. @FabKzo : Bonsoir, Désolé, je ne suis pas compétent dans cette partie du logiciel ( HDR ) une fonction que je n'utilise pas du tout. En tout cas, il doit y avoir un soucis. Peut-être est il possible d'en savoir plus en répétant l'opération mais après avoir démarré Krita dans un terminal ( en tapant krita + enter ) pour avoir des informations. Le développeur compétent s’appelle Wolthera et peut-être contacté en soirée au heures européennes sur le chat de Krita sur IRC. ( dispo ici dans un navigateur : https://webchat.freenode.net/ , channel = krita ). Can i add this ppa in a 32 bit system? @Marcos : Hi Marcos, I guess it depends the content of the PPA. You can check on the page https://launchpad.net/~dimula73/+archive/ubuntu/krita , and filter the result with your version of operating system ( eg. here I use Linux Mint 17.3 based on 14.04 trusty ubuntu , so I filter by 'trusty' to see the available package ). Then I click 'view package details' to see the list of package. Usually, all PPA compile for amd64 (64bit) and i386 (32bit). Good luck ! Thanks for the feedback, i use Xubuntu 14.04.4, and when i filter it shows the result. Thanks again for your time. Love your work. Note, if possiple It will be cool if you show us all the ppa that you use for your application, like blender, hougini etc... For user that starting is a good reference to now where to get latest version, since that ubuntu repositories by default always come with old version. @Marcos : Thanks for the feedback ! Thanks for your time, as always you are so amazing person having time for us, answering my questions and publishing such amazing tutorials. I just use this opportunity to give you a positive feedback, just for you to have an idea im from Cape Verde a remotely islands near the west coast of africa, and i follow you since sintel project to your new peper and carrot project, contributing alot for me as an artist. @Marcos : woohoo! A big thank you, I'm on the last hours before releasing a new episode of Pepper&Carrot ( ep 15! ) and your comment fills me with energy to keep going all the night to polish details. Thanks! See you around soon. Is there already a repository with Krita 3.0 for Ubuntu (16.04)? I searched the web but couldn't find anything. The download on the Krita website is an appimage, which is okay if you want to try it but I can't work with it that way. Using the appimage Krita is not aware of my settings or brushes I already made in my installed version nor can I use OpenGL. The system isn't aware of Krita 3.0 also. Because of that I cannot open a file in Krita via kontext menu. Hey ; the ppa exist ( Krita Lime ) but it will be removed soon because maintaining the ppa is too much work for the developpers. I thought about Manjaro, too because it has Krita in version 3.0 in it's repo already. I just recently moved to Kubuntu 16.04 and was already a bit disappointed with Kubuntu 15.04 and 15.10. The new Plasma-Shell was too buggy and some stuff like the Wacom-Settings dialog was missing and other things were simply broken. I had to configure my tablet via command line from 15.04 and on which is a pain. Maybe I just compile it for Kubuntu 16.04 myself (I'm not that happy about the new snap format) and try how it works for me but most likely will move to Manjaro too. Can you tell me anything about (wacom) tablet support in Manjaro? I have same observation as the one you describes for the test with last 'buntus . I also tried to build the wacom-setting for KDEplasma5 , I saw a branch for it, but it wasn't updated since last autumn and refused to even build on my side. I also now configure my tablet with xsetwacom from command line ; and install a dedicated displayCAL to calibrate colors... What a regression! In 2011 I was able to do all of this via GUI within the same desktop environment ; and even on 2007 or 2008 the wacomcpl was managing this for all desktop. Wacom support in Manjaro is non-existant. Manjaro is similar to ArchLinux for the technologies ( using pacman / AUR / compatible with the Arch wiki ) , but has an installer, script to install newer kernels, a add/remove app GUI app, and script for proprietary gfx driver. They have their own repo ( more or less mirrored from Arch stable ) and as far as I understood do system upgrades a bit differently from Arch. So far, I spent only 8 days painting with this and the default Krita 3.0 package of Manjaro, and it's well packaged. But I need to spend month in it to see how it's behaves on long terms. I already was a Manjaro user for a long period, and I had issue with a system upgrade. Rolling-release-system are still a bit dangerous. On the top of the Manjaro OS ; you'll find XFCE, or KDE or GNOME ( a lot of spin exist ) with customised theme and colors... Good luck! I'm not only an artist but also a developer and was on the verge of writing a program to configure the tablet myself but I don't want to write the tools, instead I want to use as much of my spare time as I can to paint. I once met one of the Krita developers. I don't know if he still works on that project but I think I'm going to write him and ask for help. Maybe they can take tablet configuration into Krita or something because Krita itself gets hard to use if tablets don't work with the system. Or we should request it as a feature on the Krita bugtracker. If all fails and nothing happens in the next release I can see that I'm writing the Program myself, probably just GUI front-end for xsetwacom for a start. I could probably live with using the terminal but it's just too complicated for new and unexperienced users who just want to draw and I want everyone to be able to paint. I compiled it myself today and tried it but it's impossible to work with it. After every stroke it takes some time before the brush is 'applied' to the canvas. On long brush strokes it even takes a few seconds to render and the outcome is impossible to predict. that must be one of the issues you mentioned. Hey! I see the krita-2.9 package, but I don't see any available for the 3.0 release. Will there be one available in the ppa soon? or am I looking in the wrong place? Yes, the PPA is dying a little, Krita developpers will close it probably soon. I think the Krita 3.0 is 'krita-next' package in the ppa, but I never tested. The future method to get Krita on this platform will be via appimage/flatpack/snap. The best software for linux. Use and recommend.